Usual day. 10.5 total for me. Usual distances for the kids - with some exceptions. Benjamin did only 6.5 + some running around campus. Julia could only do 1 mile. With Joseph - part with Benjamin. We had two very talented runners in the race - Creed and Davin Thompson, both 13 years old. Training background according to their mother Jenni just playing soccer. But in spite of the lack of experience and training they paced themselves very well. As usual there was a pack of kids starting out faster than me that I passed after about half a mile into the race. Thompson brothers were not in that pack - they were behind me. They trailed me for the entire race being maybe 5 seconds back. Then in the last quarter they pulled up and passed me. I thought they were both gone, but I was able to pass one of them on the home stretch. Very different - usually if a kid is not ahead of me half way through a race he does not end up ahead at the finish. At the same time if a kid is a head of me with 100 to go, he usually gets further ahead. Not this time. I wonder how fast Davin and Creed can get with proper consistent training and good recovery. 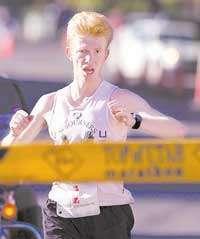 They just ran an equivalent of about 17:20 honest road course in Utah 5 K at the age of 13 with no consistent regimen. I told their mother assuming good training I was definitely expecting to see them in the trials in the marathon, with a very good possibility of being in contention for the team. Of course, lots of things can go wrong between 13 and adult, but assuming a good training/recovery regimen with a healthy mental approach, I do not think I am too far off. That said, good training/recovery is the one thing that too frequently does not happen, but I certainly hope it will be different in their case. 10 total. Benjamin still recovering from the cold, did only 4. Julia was feeling better, was able to run 2 miles. Joseph hurt his foot somehow and could only do 1 mile. Otherwise usual distances for the kids. Total of 12. Was planning on only 10, but when I had 2 left, Jenny still had 4 to go, and she did not want to run alone, so I ran all of it with her. Benjamin did 5 + some campus running, feeling better, but still not 100%. Otherwise usual distances for everybody. With Jacob, Stephen, and William - part with Jenny. Benjamin did 6 + campus running, usual distance for everybody else. Joseph, Jacob, and William did mile time trials. Jacob and William got PRs - 5:41.0 and 6:31.7. Joseph missed it by a second - 5:39.7. I gave Joseph and Jacob the rules of the game. I would let them set the pace in the first lap unless it got way too slow. Then would take over and run the second lap in 82. If they were lagging significantly by the end of the second lap, I would have them stop and the time trial would be over. The purpose of this was to teach them to run fast without the fear of fatigue. If you are slowing down in the third lap, it could very well be due legitimate fatigue. But if you are still a good 10 seconds slower than your 800 PR and you are slowing down in the second lap on a normal day, it is nothing other than fear. So we had a good start in the first 200 with Joseph leading the way, then around 300 I saw the pace dropping, and took over. Joseph had an attitude and immediately stopped. I ignored him and just continued with Jacob. Our first lap was 83. I ran the second lap in 82 as promised, Jacob faithfully followed up to 600, then he started to doubt and let the gap develop, but he was only 1 second behind at 800, so 83 - 2:46. With 600 to go I had 3:31, Jacob 3:33, then I had 3:53 with 500 to go, he was 3:54. Do not recall exactly what we had at 1200 and with a lap to go, but I would estimate Jacob had 4:14 high (88 lap), and 4:17. He ran the last lap in 84 (43,41) and got his record by over 1 second, but barely missed the 5:40 barrier. We will try again next Friday. Then I paced William. We opened in 1:33, then 1:38, and a plop to 1:44 with a kick in 1:33 (48,45), the balance going to the 9.34 meter tax. A very good PR, improvement by almost 5 seconds. However, still issues with fear in the third lap as evidenced by the fourth. With William, though, I am happy he is where he is - he has had some mental challenges, a doctor would probably diagnose him with something if we wanted to get a diagnosis. Leg-wise very talented, but will need some special nurturing to become mentally focused. He is only 7, though, so we have plenty of time. Then I paced Joseph, though I was not happy that he made me run another fast mile. He opened in 83. I tried to take over at the start of the second lap, but he sped up and would not let me pass. I decided to not get into a sprinting match with him, and waited until we hit the headwind at 500. At that point I took over and blocked it, but Joseph now was worn out from his surge, so he could not follow. I hit 800 in 2:46 (83), Joseph had 2:47. At that point I considered just stopping him, but figured he is tough and might be able to recover enough to get the record. He almost made it, but was too late to respond and follow. 4:13 high at 1200 (85), 4:16 with a lap to go, 83 for the last lap. Afterwards he was very upset, once he calmed down, we had a discussion about how Steve Prefontaine ended up without a medal in the 1972 5000 final. I explained to Joseph that running directly behind within an arms reach of your competitor is a position of strength that allows you to maintain the pace while expending less effort, and that runners who lead obsessively rather than only when they have to end up underperforming. I think this was a good lesson for Joseph. Warm-up: Joseph, Jacob, William, and Stephen running, Matthew in the stroller. With Matthew - no hand. Back to the house. Everybody running, Matthew in the stroller. Only about 15 for me today due to getting up late and not wanting to miss general conference. Benjamin and I did a workout. He was still not 100% recovered from the cold, so he just did my workout. First we did 8x0.25 up the canyon with 100 meter recovery targeting 30 seconds, but we botched it a few times running it in 35. On the quarters we fluctuated between 83 and 87 high with the average of around 85 high. This was very tough for me, but I wanted to get good resistance running practice given that we are running in the Monumental Half in November which unlike most Utah halves does not have downhill. After the hill repeat session we did a lactic clearance tempo down the canyon - 3 miles in 16:38, splits 5:38, 5:36, 5:24, last quarter in 79. Kids ran their usual distances except Julia did 3 and Joseph did 6. Benjamin ended up with a bit less than 11. Uphill 8x0.25 with 100 recovery. With Joseph and Grant after the General Conference Priesthood Session.